I have a confession. I felt I was doing quite well parenting my tricky children. I generally know what Bunny and Kitten need to make things work and I can manage things fairly well on a daily basis. Not well in the conventional sense. I have a horrible feeling that many people would be quite appalled if they lived with us. In fact when I stand back and look at our lives sometimes I’m appalled too. But actually for us, in our 3girlstogether therapeutic bubble, things have been plodding along ok. In fact the second week of the Christmas holidays was our best so far. Fast forward to this week and we have the half term holiday. I was looking forward to it and I know the girls were too. So my confession is that I got arrogant cocky a bit overconfident. This week has been pretty dreadful. Bunny has been out of sorts for the whole week. Alternatively clinging to me and rejecting me, unable to cope with even the simplest activities I have planned. She has spent much of the week shut down unable to speak, generally with a dummy in her mouth for comfort and crying lots. When she is not in this state she has been angry and frustrated with her sister, very demanding and controlling of me. Kitten has been like Tigger on speed. She has brought forth her most dysregulated out of control behaviours; stimming, bouncing, singing the same 5 notes over and over again for hours on end, jabbering endlessly, unable to settle to anything, controlling, self harming, destructive, angry, oppositional – the list goes on and on. And me? I am feeling shell shocked. These behaviours are not new to me but the tricks I have up my sleeve to prevent or reduce them are failing miserably this week. This is where being a single adopter is tough. There’s no-one to turn to who can take some of the burden. I have friends who are adopters and they give me lots of moral support for which I am thankful. I could ring CAHMS for a friendly supportive ear and they will always make time to chat to me. But they won’t suggest anything I’m not already doing. I have to deal with this myself. Do I sound like I’m feeling sorry for myself? I don’t mean to. The worst thing about this week is that my girls rely on me to keep them regulated, feeling calm, safe and happy. And this week I haven’t been able to do that. So it is my children who are suffering most. I am tough. I will be fine. But my girls….they are waiting for me to help them and this week I’m failing. So maybe my confession is not that I got overconfident, but that this week I have failed to give my children the help they need. And they deserve more than that don’t they? 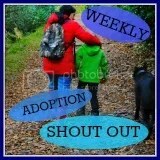 This entry was posted in Therapeutic Parenting, Uncategorized and tagged adoption, failure, holidays, RAD, therapuetic parenting on February 19, 2014 by 3girlstogether. You haven’t failed! Its half term! My guess is that all those behaviours that your experiencing this week, might be nothing new, but I bet they have been ramped up from high to over drive. Half term causes so much anxiety for our kids, too much change, not enough routine. You definitely haven’t failed! What you are doing is amazing!! As adoptive parents we are expected to take everything that is thrown at us, without showing a chink in our armour. But we are human. I don’t think it hurts to show our children that every now and again we also find life tricky. Thanks for that. It’s true that we are only human. I guess the problem for us is that if we fall short it’s our children who suffer. Hard to live with that knowledge some days! Thanks @purdy2233 I just want them to feel some happiness and I’ve really not managed it at all this week. Back to the drawing board I guess! Oh, so sorry to hear you’re feeling that way! Guilt is part of the parent package, but I think it can be worse for adopters! Now, I am not there, so I have no idea whether you have made any mistakes at all, or whether this is just a tough time. Sometimes, you can’t regulate the kids. Sometimes things will be messy and horrible even if you do everything g right. But, in case, you’re correct, and you gave slipped from the perfect therapeutic parenting, that is ok too. Your children deserve you, the real you. They deserve a real family, not a live-in therapist! Tigger on speed? I know it so, so well. It describes my son precisely. My heart goes out to you, holiday periods can be really tough. I find any kind of break in routine or transition is a trigger for disregulated behaviour. You don’t remotely sound sorry for yourself. Therapeutic parenting is hard work. I find it relentless enough and I have a partner and can escape to work sometimes – you’re doing an amazing thing. On a practical note, is there any chance your social worker could arrange some respite? This stuff is so wearing. Hugs – lots of hugs. It sounds to me as if you are doing brilliantly being a proper Mum. I feel so honoured just to be able to watch quietly from the sidelines as you tell it how it is. I learn so much. Well done for just being you with all that that is, has been and will be. And thank you for being there to show those far behind you on the journey how it can be and how come what may you survive.